Blog ▷ The Ketogenic Diet: Does it Actually Work? It’s nearly impossible to have a conversation about dieting or weight loss without someone mentioning the ketogenic diet or “keto.” Magazines and talk shows tout keto-friendly recipes while many high-profile celebrities have publicly attested to the wonders of this high-fat, low-carb diet. 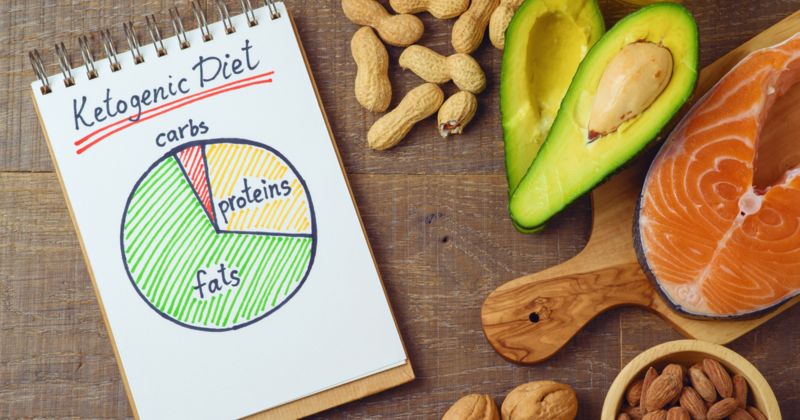 But is this just another trendy diet fad or does the ketogenic diet actually work for long-term weight loss and health? Read more for the 101 on going keto. The ketogenic diet is centered around extremely low carb intake and encourages high fat and protein consumption. Far from a plant-based, a keto meal plan encourages lots of meat, seafood, and cheeses – sound familiar? Despite keto’s recent skyrocketing popularity, this ultra low carb diet is very similar to the enormously popular Atkins diet that dominated the weightloss industry from the early 1990’s to the 2000s. The main difference between keto and Atkins is that keto is not a high protein diet and instead, is high fat. The reasoning is that depriving the body of the blood sugar found in carbs – the body’s primary source of energy – will then force the body to use the existing fat as source energy. This process of breaking down stored fat is called ketosis and is where the ketogenic diet gets its name. Activating ketosis typically takes two to four days of restricted carbohydrate consumption (less than 50 grams, although it can vary between individual cases. The macronutrient nutrient breakdown of a ketogenic diet is 5% carbohydrates, 20% protein, and a whopping 75% fat. These percentages vary slightly depending on the type of ketogenic diet, but the focus is always on reducing carb intake at all costs. The average American diet is typically 50% carbohydrates which can make this diet plan challenging to maintain long-term – but even short-term adherence to this diet plan has been shown to accelerate weight loss. Foods that are encouraged on a keto diet are unprocessed meats, fatty seafood, eggs, and high-fat sauces such as butter and olive oil. While most diets encourage the consumption of all vegetables, the ketogenic diet has restrictions on some of the veggies you can eat. Leafy greens such as zucchini, broccoli, cabbage, and avocado are allowed whereas starchy vegetables such as potatoes, sweet potatoes, and nuts aren’t considered keto. The keto diet has proven to be useful for managing weight, diabetes, and epilepsy, as well as possibly being effective for cancer and other diseases. However, such a diet can be difficult to maintain long-term and high amounts of red meat, fatty, and salty foods (which are allowed in the diet) are known to have detrimental effects. If you are thinking of going on the ketogenic diet, consult with a doctor near you before increasing your consumption of meat and other fatty foods which can exacerbate any pre-existing health conditions. If weight loss is your primary goal try FAT BLAST Fusion, a weight loss IV treatment that helps to stimulate your metabolism and help you lose weight naturally. For more information visit GMP Medical in Hialeah or call at 350-330-1442.